What is a Laparoscopic Sleeve Gastrectomy? A laparoscopic sleeve gastrectomy is a nonreversible weight-loss procedure that reduces stomach size by 85 percent. It generates weight loss solely through reduced food intake. Before undergoing laparoscopic sleeve gastrectomy surgery, you will need to diet to reduce the amount of fat around your liver. You need to drink only clear fluids for at least 48 hours before the surgery. You should also stop taking all medications, and you should get your colon cleansed. During surgery, the stomach is divided vertically. The portion of the stomach that remains is shaped like a very slim banana, or sleeve, which measures from 1 to 5 ounces. There is no intestinal bypass, only stomach reduction. 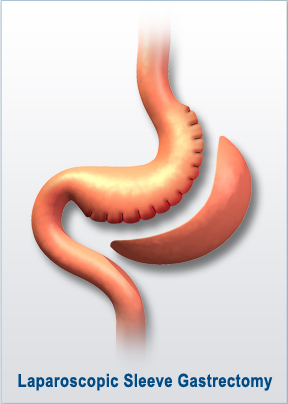 The lack of an intestinal bypass reduces the risk of potential long-term complications such as marginal ulcers, vitamin deficiencies and intestinal obstructions. Similar to the traditional gastric bypass, after the laparoscopic sleeve gastrectomy you will feel satisfied with eating smaller portions, so you will be able to limit the amount of food you eat at one time. You will need to change your overall diet and eating habits, including drinking at least eight cups of water per day, chewing your food completely and consuming smaller portions. Studies have shown that patients who undergo a laparoscopic sleeve gastrectomy lose 55 to 65 percent of their excess weight within one year. The surgery also may reduce cravings for sweets and improves overall quality of life. Also, because it is a minimally invasive surgery, it requires a shorter hospital stay and results in a faster recovery time.